A team of archaeologists and students from the University of Nebraska-Lincoln, Atatürk University and local workers have uncovered a massive 1600-square-foot Roman mosaic in the ancient town of Antiochia ad Cragum near modern-day Guney on the southern coast of Turkey. The geometric black-and-white mosaic dates to the third or fourth century A.D. and is in excellent condition. Its condition is particularly impressive given that it was first discovered in 2001 after a farmer turned up some ancient mosaic tiles (tesserae) while plowing the land. Purdue University classics professor Nick Rauh, director of an archaeological survey of the ancient standing architecture in the region, saw the tesserae when he walked through the plowed field. He alerted his team members and experts from the archeological museum in Alanya, 40 miles up the coast. Although the find was certainly intriguing, located as it was adjacent to the standing remains of a Roman bath structure, the Alanya Museum did not have the funds to excavate further at that time. They returned two years later and revealed a small sliver of the mosaic, then stopped again. In 2005, the University of Nebraska team under director Michael Hoff began a new research project focusing on the Roman Antiochia ad Cragum. Hoff had been a member of Nick Rauh’s survey team in 2001, so he personally remembered the discovery of the tiles but this project was focused on surveying the third-century Northeast Temple. 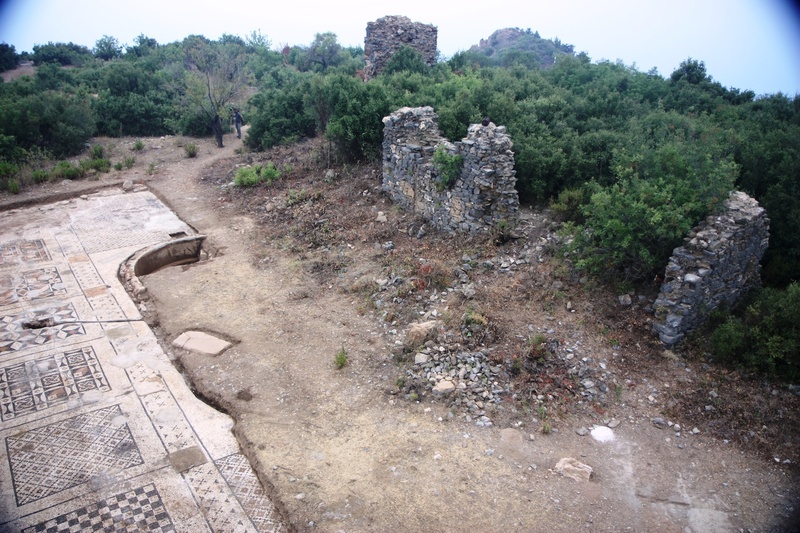 In 2008 they were granted a full permit by the Archaeological Directorate of the Turkish Ministry of Culture to excavate the temple and the rest of the city, but excavations on the temple didn’t begin until 2009. Last year the Alanya Museum secured a permit to explore the mosaic further. 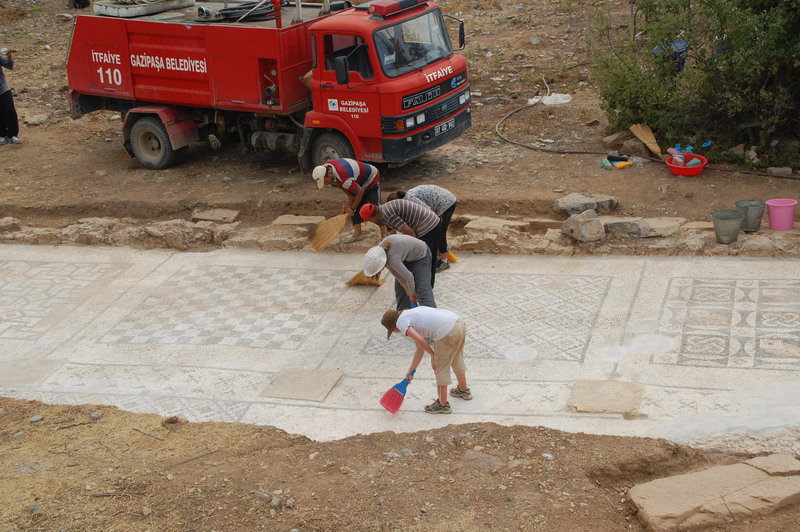 They invited Michael Hoff’s team to fully excavate the mosaic, clean it and conserve it so tourists and scholars can see it in all its glory. This year’s large team — in addition to the experts from three universities there are 35 students from diverse disciplines like journalism and art participating in the 2012 field school — began to uncover the rest of the mosaic this July. 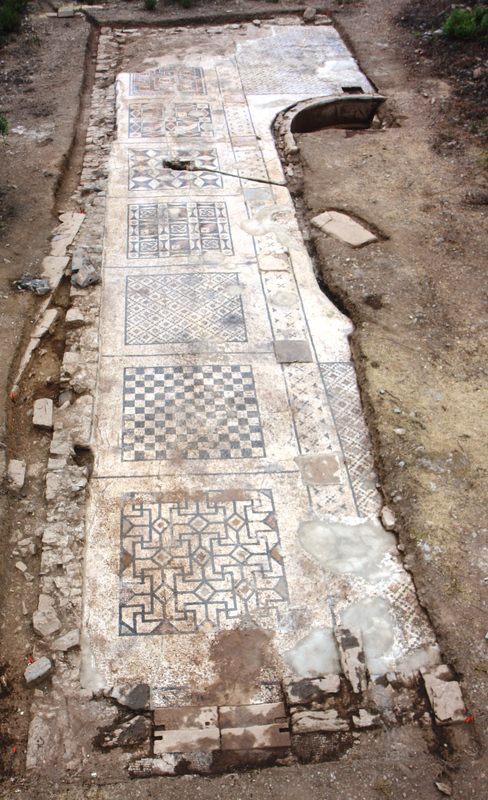 The more soil they removed, the more mosaic they found, ultimately revealing an entire floor decorated with modular square after modular square of different geometric themes done in black and white opus tessellatum (large marble tesserae) style. 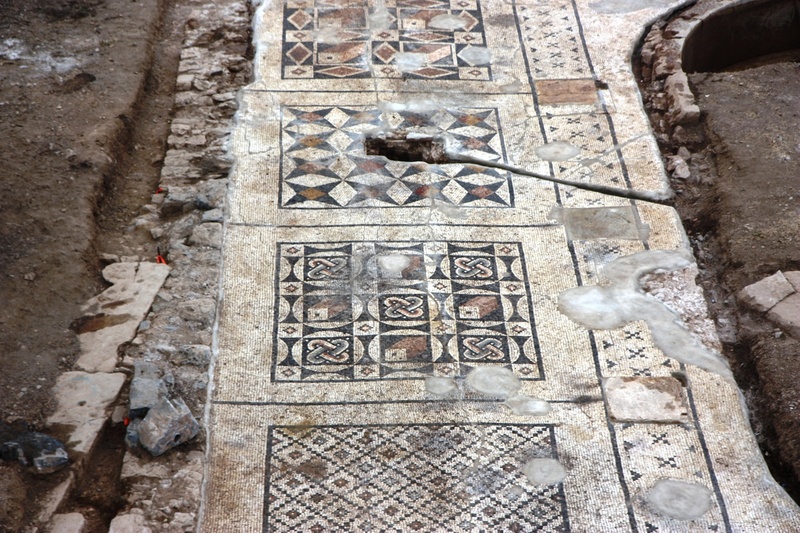 With an estimated 40% of the mosaic uncovered, 1600 square feet have been revealed. The curved edge of a 25-foot-long marble-lined bath has also been revealed. The mosaic leads right up to it, so it was a formal poolside pavement. The pool was uncovered, open to the sun and elements, but piers that once held a roof over the mosaic pavement are still in place. Mosaics in this style were often created to reflect roof elements, so for example each large square with one geometric design could have had a section of roof above it that was the same dimension. 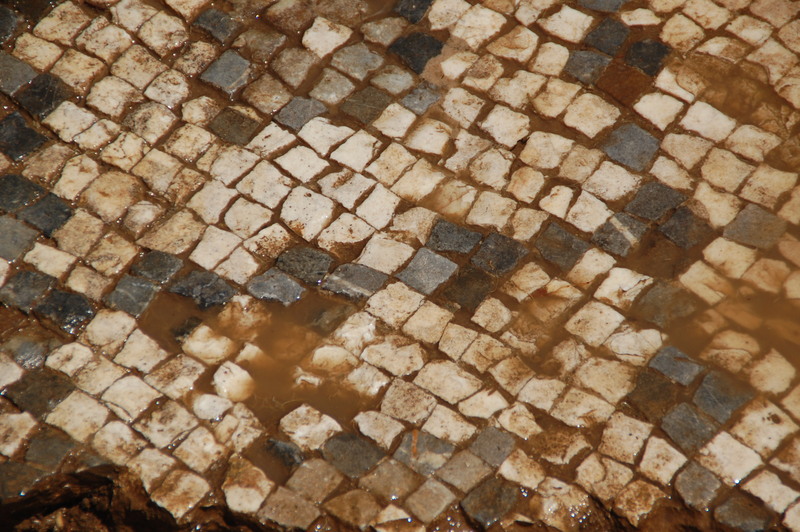 By the peak of the Roman Empire, this was the most popular style of mosaics all over Roman territory. It was easier to create than figurative mosaic and the larger tesserae were easier and faster to install. However, this particular example is exceptionally high quality. It size and detail is not the kind of thing you’d expect to see in a small town in the far reaches of empire. Antiochia ad Cragum was fully Romanized and was very well-appointed with baths, temples, markets, but it was hardly a great capital and it was in a region called Rough Cilicia, best known as the home base for the much-dreaded Cilician pirates who found the profusion of coastal coves and inlets created by the meeting of the Cragus mountains and the Mediterranean Sea congenial to their needs. With Rome in a panic after pirates sacked the Roman port at Ostia, burning down the port, destroying the consular fleet and killing two senators in 68 B.C., the next year Pompey Magnus was given a blank check by the controversial Lex Gabinia to wage war on piracy. It took him a mere three months to shock and awe the Mediterranean into submission with his fleet of 500 warships, defeating the Cilician pirates with a conclusive naval victory at Alanya. So he claimed, at any rate. There’s some debate as to whether the Cilician pirates really settled down to farm as he said they had or just went back to privateering on the seas only in a more circumspect fashion. 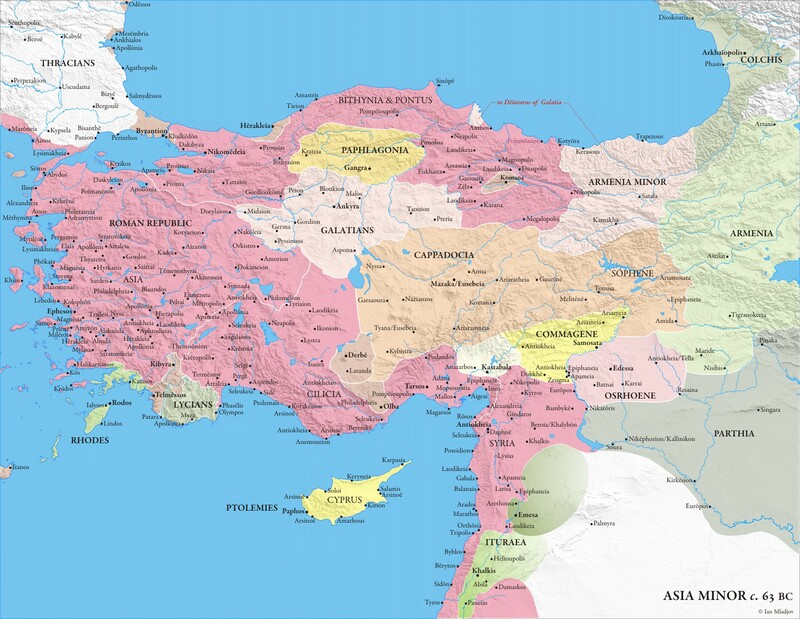 At that time the area was still independently held by Hellenistic rulers. By the first century A.D., though, Rome held sway over the entire region. Caligula gave Rough Cilicia to client king and personal friend Antiochus IV of Commagene in 38 A.D. He lost it for a bit then got it back courtesy of Claudius in 41 A.D. He held it for the next 31 years, and somewhere during that time he built the Roman city of Antiochia ad Cragum, possibly on the site of a previous Hellenistic town founded by Seleucid (meaning the Greek part of Alexander’s empire gobbled up after his death by his former general Seleucus) Emperor Antiochus IV Epiphanes. Antiochus IV Epiphanes is personally responsible for an idiom still very much in use today. In 170 B.C., he launched an attack on Ptolemaic Egypt. It was successful; he captured Ptolemy VI then reinstalled him on the throne to act as his puppet. When Ptolemy VI and his brother Ptolemy VIII Euergetes agreed amongst themselves to be co-rulers, Antiochus was displeased. This was not the puppetry he was looking for. He launched a second attack on Egypt in 168 B.C., but when his armies were just about to reach Alexandria, he was met by a Roman consular delegation led by one Gaius Popillius Laenas. I’ll let my homie Livy take it from here. After crossing the river at Eleusis, about four miles from Alexandria, he was met by the Roman commissioners, to whom he gave a friendly greeting and held out his hand to Popilius. Popilius, however, placed in his hand the tablets on which was written the decree of the senate and told him first of all to read that. After reading it through he said he would call his friends into council and consider what he ought to do. Popilius, stern and imperious as ever, drew a circle round the king with the stick he was carrying and said, “Before you step out of that circle give me a reply to lay before the senate.” For a few moments he hesitated, astounded at such a peremptory order, and at last replied, “I will do what the senate thinks right.” Not till then did Popilius extend his hand to the king as to a friend and ally. And that, boys and girls, is where the expression “to draw a line in the sand” comes from. Antiochus IV Epiphanes is also responsible for Hannukah, since as ruler of a Judea in revolt against his deputies in 167 B.C. he sided with Hellenized Jews, made traditional Jewish worship illegal, killed a few tens of thousands of people and instigated the Maccabean revolt. Antiochus IV of Commagene was finally deposed by Vespasian in 72 A.D. After that, Antiochia, Rough Cilicia and Cilicia as a whole became a directly governed province of Rome. There hasn’t been a great deal of archaeology in the region, but we do know that by the third century A.D., Antiochia had indeed become a prosperous exporter of agricultural goods and timber. The gigantic mosaic indicates that it was perhaps more than that, regionally significant in a way we hadn’t realized. The field work is done for the season, but next year the UNL team will be back to uncover the second half of the mosaic. They plan to build a roof over it again to help protect it from the elements and keep it safe for future generations. This entry was posted on Tuesday, September 18th, 2012 at 8:30 AM	and is filed under Ancient. You can follow any responses to this entry through the RSS 2.0 feed. You can skip to the end and leave a response. Pinging is currently not allowed. Oh ya, the Romans were all over the Mediterranean after the defeat of Carthage. Turkey has some of the most spectacular Roman remains, particularly mosaics. Impressive blog indeed, the accuracy was sharp, thanks for all the info. it was priceless. Constant struggle in the Middle East: The clash between Ptolemy VI versus -his uncle?- Antiochus IV was part of already the 6th Syrian War: Ptolemic Egypt vs. Seleukid Empire. Earlier, a certain Ptolemaios as well as Mr. Seleukos, son of Antiochus, were both ‘Diadokhoi’ of Alexander the Great. There even were Galatian Celts. On your map there are ptolemaic names allover, ‘Arsinoe’ for instance, and at least three times ‘Antiokheia’. The Romans in return were at this stage, i.e. the 6th Syrian War, not yet addicted to ‘petra oleum’ but instead to grain from Egypt: To make an offer to Antiochus IV ‘that he could not resist’, i.e. to draw the circle, was therefore obvious. I have visited Paphos on Cyprus, which a little later was to Rome a relaxing retreat -w/ brilliant roman mosaics of course- as e.g. Florida is today, …well, till the struggle was continued. Brethren, to conclude I finally ask you nonetheless: What have the Romans ever done for us ? … ok, roman style mosaics and maybe the war on piracy, anything else ? I’ve seen various reports on this but I want more pictures. There’s one more picture (a close-up of the curved edge of the pool) at the University of Nebraska-Lincoln link which I didn’t embed in this post. Yes, I saw that and I watched the video, but I hope they publish pictures of each design rather than just overviews. Don’t have the time right now to research for other Roman mosaics in regards to their sizes and intricacies. But after I used Google to convert 1600 square feet to square meters (ca 150) and saw the size compared to people in the video, this actually doesn’t seem so large, so intricate, so fanciful, or so out of the ordinary. In fact it seems to be a general run-of-the-mill geometric flooring for a normal-sized complex in some middle of nowhere location in a huge empire. Other than it still looks nice! Wow, you’re hard to please. It’s not so run-of-the-mill when it’s that well-preserved. I can’t recall seeing any like it in Rome itself, for instance. I was stationed in Turkey at an USAF base. You can’t throw a dead cat without hitting some ancient thing; i.e. Crusader castle, tombs carved into cliffs you can photograph while driving by, small museums with amazing pieces they found outside their front doors. A most fascinating place to live for 3 years. But, forgive me, I hope they re-covered/paid some locals to guard this find. Anything we left laying around loose in our yard promptly disappeared. This could be sold (in pieces) for big bucks and there is a great deal of poverty in Turkiye. I don’t really blame them (hatred for Greece/Rome is still very real)but I hope they are being realistic.